Keep up-to-date with Saunton Sands' latest news. Places and things for you to see and try! Phoenix De Giorgi - Finalist! Our very own Phoenix De Giorgi is a finalist! Discover everything we have planned for February half term! 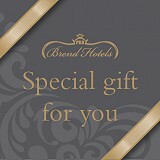 How will you give the gift of Brend Hotels and Saunton Sands this Christmas? Our Saunton Black November offers are here! Are you looking for the perfect venue to host your corporate Christmas party? We're delighted to announce that our brand new state-of-the-art gym is now open! Source Spa and Wellness opening 1st September! See our fabulous 2018 entertainment programme! We're up for 2019 Conde Nast Awards. See out top ten picks for this summer! The Tour of Britain will be back in North Devon once again - and they'll be coming right past our door! Closed due to a private function. Have you seen our Times and Sunday Times Review? See our latest Times review! We're featured in Flight Time! Read our fabulous review by Stan Abbot! Visit us and save 20% off your next break! Secret and remote beaches in the South West, a must visit for those looking to explore! Did you see we made the top 3 in the The Times great weekend guide? Preparations for this year's D Day Celebrations are underway! Stay at Saunton Sands and we'll provide you with some fantastic discounts to attractions in North Devon. Discover which ones here. A wonderful place to spend time in Nort Devon, discover why RHS Gardens Rosemoor is always worth a visit. Discover our fabulous Whitsun programme! Devon was visited a hundred feet tall Poseidon, who is angry about the plastic pollution destroying oceans. Dez Turland, Development Chef at Brend Hotels talks us through his beef Tongue in Cheek. Dez Turland, Development Chef at Brend Hotels talks us through his Lamb Curry. Did your Valentine pop the question? Read why Saunton is the perfect location for your big day! See our jam packed entertainment programme! Have you booked your Twixmas Break yet? Don't miss our 2017 Black Friday offers! We won! Best Hotels' Hotel of the Year! Celebrate Christmas with us on the North Devon coast. Our first Foundation Degree Graduates! Congratulations to our our foundation degree graduates! See our jam packed entertainments programme! Our Sister hotel gains 4 star staus! Hurry! Book your Christmas Party Night now! We have limited availability on our Party Nights! Collect all five receipe cards for our cocktail collections. Dreaming of getting married by the sea? Rooms still available for this weekend! We've been awarded a certificate of excellence byTripAdvisor! Best Loved Hotels are now open for votes! See everything we have planned for you here this summer! Our summer ball was a roaring success! The Dining Room at Saunton is now open! We are delighted to announce our new Dining Room is now open! JoJo Maman Bebe Devon model search! North Devon mini model search! We are delighted to team up with JoJo Maman Bebe for their Spring/Summer 2018 photoshoot! We are delighted to be teaming up with JoJo Maman Bebe for their Spring/Summer 2018 photoshoot! Includes full day use of our facilities! This 54-hole championship is open to men aged 55 or over on the first day of the event and is played on two courses. Please note we are closed to non-residents today. Have you taken the tour of the simply stunning championship Links golf course here are Saunton! We are closed to non-residents for Mother's Day. Our new Ahoy has arrived! Don't miss out on Summer bedrooms! Don't miss out on our Terrific Tuesdays! Wow! What a lineup for this years Oceanfest! Our Beachside Grill re-opens soon! See our fully inclusive prorgamme here! Treat yourself with our Midweek Spa Offer! We are busy making Saunton better! Don't Miss our Wedding Fair! Perfect for that family or friends gathering! Our very own Head Chef, Jamie Coleman wins South West Chef of the Year! We made the Times Top 100! See our October Half Term Entertainments Programme! See our jam packed entertainments programme here! Due to a private function we will be closed on Thursday 12th October. Our very own Head Chef, Jamie Coleman, is once again in the South West Chef of the Year semi-finals! We are beaming with pride at having our talented chef, Jamie Coleman, once again in the South West Chef of the Year semi-finals on Saturday 8th October. Have a guess who Coast Magazine, has picked to include in their top 10 coastal hotels in Devon?! Take advantage of this fabulous price! Because we know how much our guests love ice cream!